What's in store for the 2018 Countryman's Fair, and highlights from past events. The Devil’s Horsemen love returning to their roots to entertain live crowds when they are not filming – an experience that is as invigorating for their horses as it is for their riders. 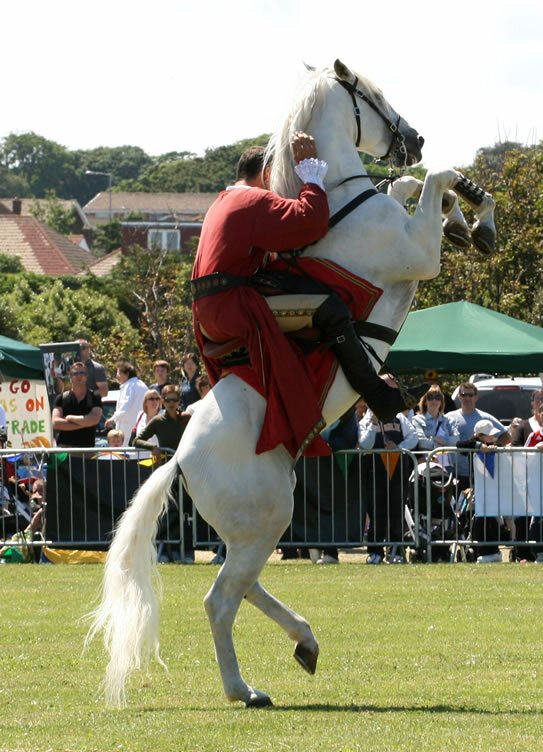 For audiences, it is a fantastic opportunity to meet the famous equine stars and to witness them perform enthralling film-set stunts and tricks in real life. Wild West Show: Modelled on Buffalo Bill’s Wild West show of 1896, The Devil’s Horsemen performance is a magnificent display of horsemanship set against a comedy narrative, with full commentary and background music. It is a salute to America’s true folk hero, the cowboy. Watch The Devil’s Horsemen take part in a shoot-out, stagecoach chase, choreographed fighting, trick-riding, a Roman-riding race and a classical high school dressage display. We will also have gun-dog displays and, back by popular demand, Hound Parade and the Bideford Youth Pipe Band who will again entertain the crowds with the skirl of the pipes and the swing of the kilt. Please visits our Stands page for a full list of trade and craft stands, plus more information on how to become an exhibitor. There are various different elements to the Countryman's Fair Dog & Hound shows. We have the Cornwall Field Trial Society working test, the Family Dog Show, with Agility classes and Gundog Scurry too, and our Hound Show. For more details visit the dog & hound show page. There will be a Clay Pigeon Shooting competition. BASC will also be present, bringing their instructors so that people can have a go at shooting clays with a shotgun. West Country Rivers Trust organised an excellent program of fly-fishing demonstrations and Have-a-Go sessions at the fishing area by the lake and there was a chance to see coarse fishing too.